India’s largest employer is, and has always been, agriculture. The sector contributes to 17 percent of India’s GDP and employs over 56 percent of its workforce. Yet, it remains largely unorganised and fragmented. Smallholder farmers, or those owning less than five acres constitute 80 percent of the entire farming community. Despite large investments by government and private sector to standardize and cut inefficiencies in the supply chain, India’s smallholder farmers still face myriad problems in their efforts to market their output. Yet the advance of agritech and fintech are two very common tags of late. An almost aggressive rate of innovation has been seen in both these areas and the positive outcomes have been immense. An amalgamation of the two sectors could have an incredible impact for the masses, especially populations that work within the agriculture chain. Many companies are already using a variety of tech solutions to process financial transactions prevalent in agriculture. Making those apps and other digital solutions more user-friendly is critical to expanding their usage. Most steps within the agricultural value chain require some financial activity. From granting loans to enabling savings to insurance – companies should be able to provide these services affordably or enable current providers to be more efficient. Startups the world over are working on innovative approaches to solving complex problems in agriculture. 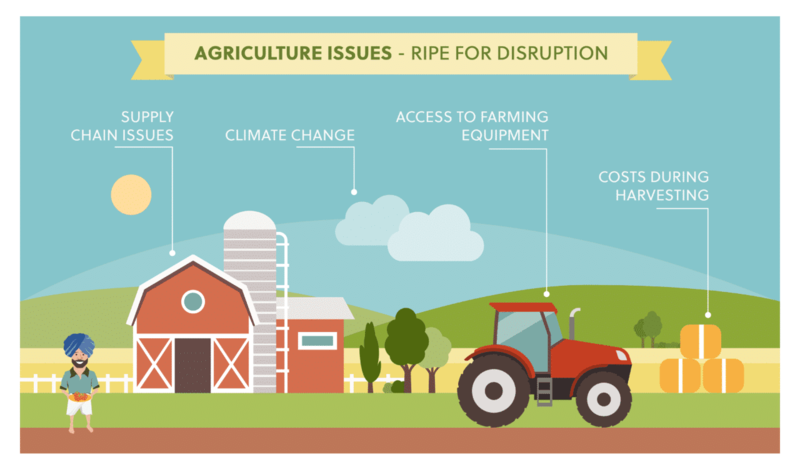 Let’s dive into a few areas in agriculture that are ripe for disruption and how startups are leveraging technology to solve the many issues smallholder farmers face daily. 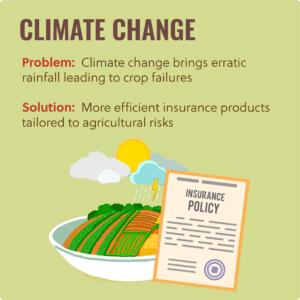 Insurance Products: Recent years have seen drastic changes in climate around the world; this directly affects rainfall timing and amount, bringing either too little or too much rain, both of which are harmful to the crops. As a result, insurance products that are tailored to address agricultural risks are crucial for farmers. Of course, products need to be appropriately priced and made easily available. Using smart contracts that directly track weather conditions and pay out claims in the event of risk having materialised is one way of making the process more efficient. Worldcover is a company focused on Ghana with an initial target of providing insurance for up to 200,000 farmers. The company provides transparent insurance coverage for drought and uses advanced technology to manage claims through a peer-to-peer model leveraging funds from individual investors who are excited to do good while diversifying their risk exposure. Pay-As-You-Go Financing: The agricultural sector requires heavy capital commitment. Procurement of equipment remains a major spend for most farmers, particularly smallholder farmers who are unable to afford agri-inputs to increase productivity. Pay-as-you-go financing options for farm equipment and efficient rental options streamline processes through technology, reduce the cost and increase access to farmers. 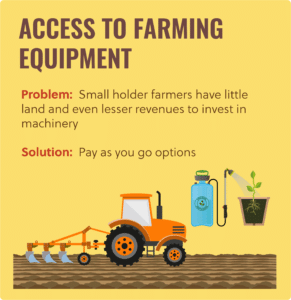 This is a win-win situation for the farmers who need the equipment as well as for those who own it but do not require it on a full-time basis, thereby creating a new income source. farMart and Ravgo, in Northern India, have already begun to disrupt this sub-sector. Adopting the shared economy principle that has been steadily gaining popularity around the world, this business model has advantages to both parties. Savings Platforms: The earnings of a smallholder farmer are often less than the consumption expenditure of their families. Savings, especially in times of uncertain weather conditions, are critical. Farmers need to be equipped to handle crop failures and other natural disasters, foreseen or otherwise. Savings platforms that are tailored to the lifestyles of communities and support everyday small savings could go a long way in helping farmers build rainy-day funds. SmartMoney in Uganda and Tanzania is achieving this by building an entire financially inclusive ecosystem within rural communities by streamlining payments between various parties working in the agricultural community. This leads to small amounts of savings that will slowly build a safety net for farmers. With over 150 institutional partners, SmartMoney reaches 2,500 merchants and currently serves 200,000 customers. Alternative Credit Scoring: Access to credit has always been one of the most prominent problems faced by Indian farmers. Though microfinance firms and banks have made significant inroads, small landholders still face roadblocks in accessing funds. 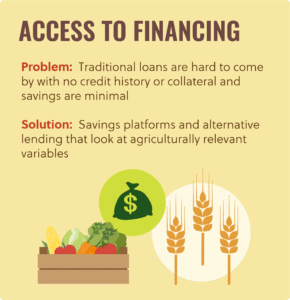 Lack of access to credit and poor credit scores are a vicious circle leading to farmers being excluded from the formal financial system. Alternative credit scoring using agriculturally relevant indicators will provide more accurate credit risk scores for farmers. FarmDrive works to provide such credit scores to farmers by using alternative datasets that are unbiased such as social, environmental, agronomic and satellite data, analysed by a machine-learning algorithm to produce relevant credit scores. FarmDrive, in partnership with microfinance company Musoni, has provided loans to more than 400 farmers, some in as little as 30 minutes. 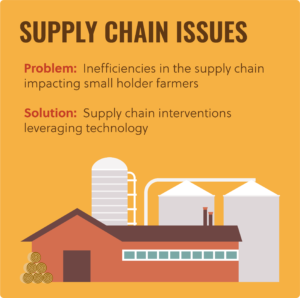 Supply Chain Interventions: Multiple inefficiencies in the supply chain due to which the farmers invariably get the shorter end of the stick are far too common. 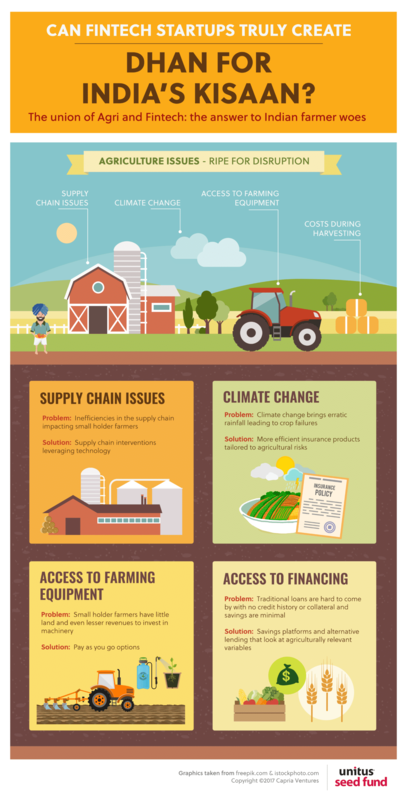 Within agriculture, supply chain interventions have received extensive funding and attention, but the reach is still limited. Supply chain interventions need to be thought through and implemented in a manner that it doesn’t cause additional road blocks. Samunnati and Arya are two companies working to increase efficiency within the supply chain. Samunnati provides the required financing for various players in the chain, while Arya is involved in providing certain post-harvest services to smallholder farmers. Samunnati has seen impressive growth in just two years; it has dispersed more than US $15 million in loans with negligible defaults. With about 15 branches and tie-ups with more than 70 farmer producer organisations, the company has reached 40,000+ small and marginal farmers. By addressing different parts of the value chain simultaneously and tackling various needs, there is an uninterrupted flow of inputs to the farmers and produce to the ultimate buyer. Addressing woes of the farmers in India and in other developing countries is a complex problem, unlikely to be solved entirely by startups. However, startups leveraging technology can work alongside banks, microfinance companies, government and others in the agricultural ecosystem to create meaningful impact. While each of these ecosystem players is working closer than ever, startups are providing the innovation so desperately needed to ensure access to the last mile.